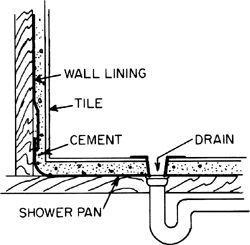 In a shower compartment or stall, a metal pan with sides above the finish floor level, in which the floor drain is located. The third bedroom also has an en-suite shower room with double width shower tray and rainfall head, and bespoke vanity unit. The third bedroom three also has an en-suite shower room with double width shower tray and rainfall head, and bespoke vanity unit. Instead of a plug, they feature a gleaming, stainless steel band stretching across one side of the white, uninterrupted, shower tray. 3 This is typically a waterproof room where there's a shower but no shower tray or enclosure, so the whole room effectively becomes the enclosure. The company will remove the existing bath and replace it with a shower tray, shower and screen, making their customers' bathing experience so much easier. The innovative material combines high performance with an extremely natural look, presenting an unusual surface texture that reproduces a spatulated cement effect, to give the shower tray an unmistakably tactile feel," explains a spokesman for the Italian firm. QI HAVE a plastic shower tray which has a split in it. When the cloakroom is too tiny for a shower tray, opt for a wet room, where the whole room effectively becomes the shower tray. The top of the control unit also serves as a shelf for shampoos, shower gel and other body care products that can be deposited on the XL EasyReach shower tray. The shower tray is quadrant–shaped and we want to put a screen and companies sell just the screen? The cubicle itself contains a shower tray, a fixed showerhead and a shower hose, a shower mat, an LED light and even a small mirror. The cubicle itself is made of light material and it contains a shower tray, a fixed showerhead and a shower hose, a shower mat, an LED light and even a small mirror.